For Molly Freeman, running was an afterthought to a larger motivation: trekking through Nepal. In spring of 1999, in between college and graduate school, Freeman and a friend were feeling lost. Inspired by an Everest IMAX movie, the pair decided to make a three-week trek through the Himalayas. While Freeman cycled to work daily, even through harsh Minneapolis winters, running seemed like a logical activity to prepare for the hiking trek. In February of that year, Freeman departed on her first run in 20-degree weather. “I had no idea what I was doing. I ran through the snow wearing too many layers and an old pair of sneakers and then ended by running up and down flights of stairs for 20 minutes. It was the hardest thing that I’d ever done, ” recalls Freeman. What started as means to get in shape has flourished into an integral part of her daily life. “Fifteen years later, I don’t feel like I know much more about what I’m doing, but I am incredibly thankful to still be running and to be continually redefining what ‘the hardest thing that I’ve ever done’ means,” she says. As a public health specialist for the Center for Disease Control’s PulseNet team, her day job could be classified a hard thing, too -- she is challenged daily in tracking food borne illnesses. Freeman has been logging miles in Atlanta since 1999, where she moved to attend graduate school at Emory University. Freeman credits her friend Linda Demma for every race she has entered. What started as 200-mile relay races, evolved into road marathons, and then trail running. The 2003 New York City Marathon marked the end of road running for Freeman, and she transitioned to only ultrarunning and trails. “Once you switch to ultras, there’s almost a fear of the marathon. It’s not the distance, but you know how much it hurts. The 50k doesn’t hurt the same,” she reports. The solitude of a solo mountain run allows her to think and focus on her surroundings. As she logs miles, she thinks through her own problems, work projects, and plans out her day and week. “I love the noises running through the woods and even the noises of the city. I solve a lot of the world's problems on my runs,” Freeman jokes. But more importantly, it was the people she met in the trail running community that has gifted Freeman with some of her favorite memories. “During overnight runs, having friends to share the adventure with is the best. There's great, positive group energy,” she says. 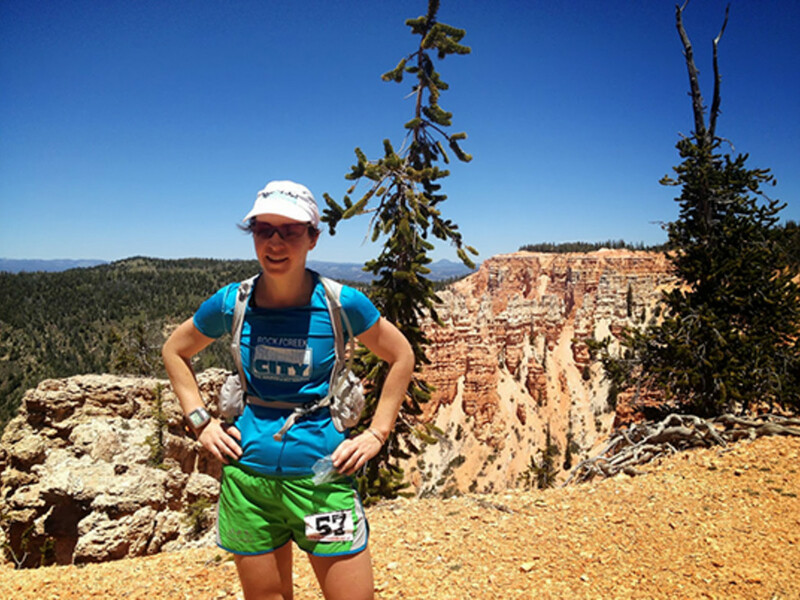 As Freeman delved into the trail running racing circuit, she took the opportunity to travel the United States, discovering trails in Alabama, the Cuymaca Mountains near San Diego, Bryce Canyon in Utah and Pisgah National Forest in North Carolina. Closer to home in Georgia, Freeman enjoys urban runs in Decatur and uses the weekends to explore deeper into the trails. Kennesaw Mountain was her first foray into trail running, and she laughs now when she compares these trails to those of North Georgia, where the terrain is much steeper and more challenging. Only 45 minutes from Atlanta, she frequently hits the Chicopee and Elachee trails in Gainesville. Freeman considers herself an ITP “Inside the Perimeter” girl, but she makes a point to support Flowery Branch’s local running store Runner's Fit. The store carries both technical trail shoes and gear, and they are masters of the area’s trails, directing several local trail races. “Ryan Kyrannakis, the store owner, is an incredibly supportive person in the running community and one of the nicest guys I’ve ever met,” says Freeman. Kyrannakis and fellow runner Johnny Garner organize one of Freeman’s favorite running teams, the Runner’s Fit/ Outdoor Mafia (RFOM). The team trains with track workouts and weekly runs, and competes in ultradistance races. “I don't get to run with these guys nearly enough, but when I do, it's always memorable and a blast,” says Freeman. “They put together some of the nicest and fastest people they could find across all running disciplines. On Freeman’s race calendar this year is GUTS’ Pine Mountain 40-miler, a rite of passage for most Atlanta trail runners. The race challenges runners as they traverse through FDR State Park on single-track, rocky trails. The race carries runners over the mountain’s ridgeline, leading through some ankle-deep muddy sections. In December, Freeman will return to Chattanooga to race the Lookout Mountain 50-miler, the first 50-miler she completed in 2011. 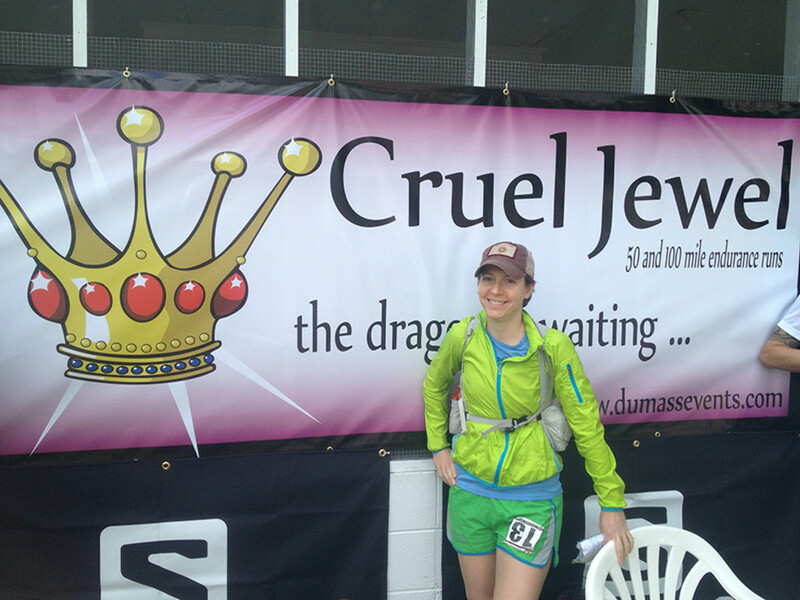 She vowed if she didn't hate it, she would sign up for a 100 miler. 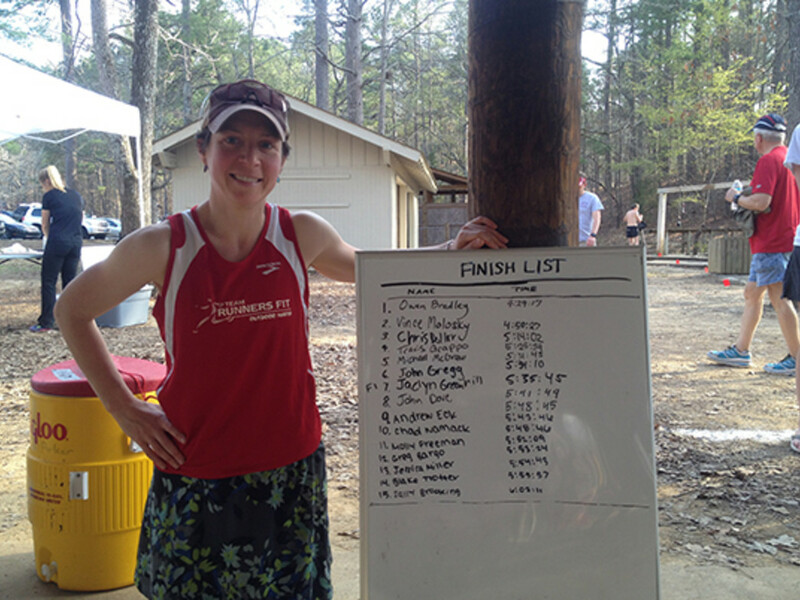 Despite a cold, muddy run, Freeman learned to race with wet feet and clothes. The next year, she completed the race an hour faster.